Although the name “Headless” might sound a bit scary, but Headless Browser Automation is a great way of creating lightweight tests that quickly send you results without the burden of actually opening a physical browser. So basically this way, we navigate to a website but save on the rendering time which may be beneficial in some scenarios like Continuous Integration where we want to have quick results and is more convenient to run from the command line(or a BAT file). *Please note that I have taken NUnit Test Framework for the sake of simplicity of execution and this is optional. 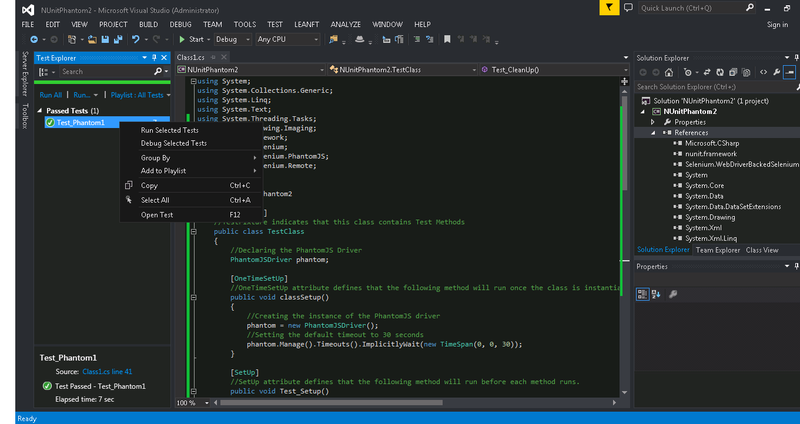 Create a New Project in Visual Studio and from the Templates, select Visual C# -> Windows Desktop -> Class Library. You will also need the phantomjs.exe from here. You need to add this to the bin\Debug folder in your project. In Order to capture snapshots(yes, this is possible for Headless Browsers also ! ), you need to add a reference to System.Drawing from the default assemblies available. In Order to run the Nunit Tests from the Visual Studio GUI, you need to goto Tools-> Extensions and Updates->Online and search for NUnit3 Test Adapter. Install this extension and restart Visual Studio. For Nunit Fundamentals, you can refer this link. //SetUp attribute defines that the following method will run before each method runs. //TearDown attribute defines that the following method will run after each method runs. I hope the comments in the script are self explanatory. You can comment below if you have any queries. thanks for share.. I will try it. You’re welcome Nelson ! Do let me know in case you have any issues while trying this out. I want to automate my web page i.e. clicking on hyperlinks and going to next page. There Selecting dropdown and press the button.